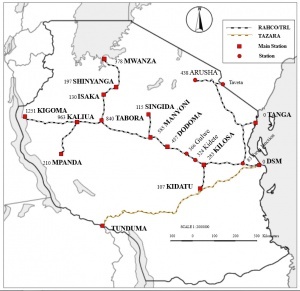 Meanwhile, China Railway No 2 Engineering Group Co Ltd has signed a US$1·4bn framework agreement for the construction of a 1000 km line in the south of the country to link coal and iron ore mines at Ludewa with the Indian Ocean port of Mtwara (RG 9.11 p25). Meldung von Newvision. By Vision Reporter. 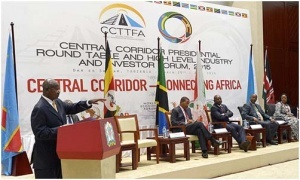 Publish Date: Mar 25, 2015 (Auszüge): President Yoweri Museveni is in Dar-es- Salaam, Tanzania to join other East African leaders in the historic summit that will witness the launching of the construction of the Central Corridor Railway-line that will link up land locked countries of the region to the Port of Dar-es-Salaam to ease the movement of cargo. Other leaders who will attend the summit at Julius Nyerere International Conference Centre include the host President Jakaya Kikwete of Tanzania, the President of Rwanda, Paul Kagame, the Burundi leader, Pierre Nkurunziza and the President of the Democratic Republic of Congo (DRC), Joseph Kabila. Tanzania Railway Ltd. 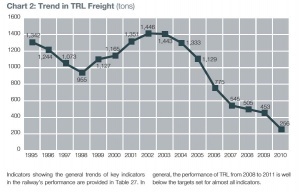 The key issue in the subsector concerns the revival of TRL. The demise of rail services has resulted in a significant loss of traffic to road transport and the latter has benefitted from substantial investment in the trunk road network. The collapse of services has had a dramatic impact on trade in the central corridor. Der Kurvenverlauf zeigt die Dramatik der Situation. Blog. Wednesday, October 3, 2012: (Central Line). Jamani, tuliachiwa reli nzuri na wakoloni, tukaizembea hadi ikaoza. Sasa inabidi warudi kuifufua zaidi ya miaka 50 ya Uhuru. Tunasonga mbele, au tunarudi nyuma? Ufisadi unaharibu nchi! ippmedia. By Khalfan Said, 28th September 2012 (Auszüge): The German government is ready to support the reviving of the ailing central railway line, the ambassador of the Federal Republic of Germany, Klaus Peter Brandes has revealed. Speaking at the embassy in Dar es Salaam yesterday, during the questions and answers session at a news brief on the upcoming second African Logistics Conference, (ALC), the envoy said, “If the government of Tanzania thinks that Germany can participate in reviving central railway line, we are ready,” he affirmed. The envoy also said his government has been supporting many projects like water and electricity, as those were the projects picked by the government of Tanzania to receive assistance from German. “So far the government of Tanzania has not yet asked for German’s support on the re-built central line,” he clarified.